(Nanowerk News) Electronics is based on the manipulation of electrons and other charge carriers, but in addition to charge, electrons possess a property known as spin. When spin is manipulated with magnetic and electric fields, the result is a spin-polarised current that carries more information than is possible with charge alone. Spin-transport electronics, or spintronics, is a subject of active investigation within Europe's Graphene Flagship. Interest in room-temperature spin transport in graphene goes back to 2007, with experiments performed by the research group of Groningen University physicist and leading Graphene Flagship scientist Bart van Wees. A discussion of that first practical demonstration of spin transport, together with a detailed technical overview of graphene spintronics in theory and practice, can be found in an article published last year in the academic journal Nature Nanotechnology ("Graphene spintronics"). One of the review authors is Regensburg-based flagship scientist Jaroslav Fabian. Moving from small-scale studies to investigations of spin transport in large-area graphene is a key step toward enabling graphene spintronics at the integrated-circuit wafer scale. The focus here has been on spin transport in suspended graphene layers, and graphene deposited on hexagonal boron nitride (hBN) substrates. As the technology progresses, longer spin lengths and lifetimes are observed, and a practical example of such a graphene-hBN heterostructure will be discussed in a follow-up article. Creating magnetic order in graphene, which in its pristine state is a strongly diamagnetic material, is a major challenge. Nonetheless, inducing magnetic moments in graphene is of vital importance if the material is to be used in spintronics. The hope is to have a tuneable magnetism through doping or functionalisation of graphene. This could be achieved through defects in the material's hexagonal crystal structure, or the influence of adsorbed atoms on its surface. "Graphene is a promising material for spintronics, given that its spin properties can not only be tailored, but indeed defined by what adatoms and other 2D materials you combine with it," says Fabian. "Once the right materials are identified – and this is what we are investigating in the flagship – a path opens towards specific technological applications." A missing carbon atom, or vacancy in graphene's structure, creates a spin-polarised electron density by stripping four electrons from the bands, three of which form 'dangling bond' states. Two of these dangling bonds contribute magnetic moments, but direct evidence of the predicted -magnetism is missing. 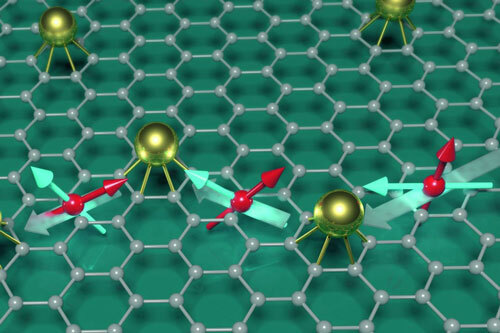 Maximising spin lifetime is critical when it comes to applications of graphene spintronics. Theory predicts lifetimes of around a microsecond for pristine graphene, whereas experiment shows values ranging from tens of picoseconds to a few nanoseconds. Only with nanosecond lifetimes and longer will spin transport in graphene prove useful in real-world applications. The more than two orders of magnitude discrepancy is a serious concern, and it suggests that the source of spin relaxation is of extrinsic origin, such as impurities, defects or ripples in the graphene studied. Despite numerous theoretical studies, the origin of spin relaxation in graphene is little understood. Two mechanisms have been put forward to explain experimental trends. Both have their origins in metal and semiconductor spintronics, and they each rely on spin-orbit coupling and momentum scattering. Spin-orbit coupling is the interaction of an electron's spin with its motion, which leads to shifts in the particle's atomic energy levels as a result of the interaction between the spin and the magnetic field generated by the electron's orbit around the atomic nucleus. The problem is that neither of the proposed spin relaxation mechanisms work. Both predict microsecond lifetimes, yet experiments show a few nanoseconds at best. The only mechanism that agrees with experiment for both single and bilayer graphene is based on resonant scattering by local magnetic moments. This model was proposed by Fabian's research group in Regensburg. What recent studies indicate is that electron mobility is not the limiting factor for spin lifetime, and scattering between charged particles and impurities is not primarily responsible for spin relaxation in graphene. That said, determining the primary source of spin relaxation remains an important challenge for graphene researchers. Identifying it should help raise spin lifetime in graphene towards the theoretical limit, which will have important implications for both basic science and technological applications. Examples of spin-logic devices include rewritable microchips, transistors, logic gates, magnetic sensors and semiconductor nanoparticles for quantum computing. These and other opportunities for graphene-based spintronics are discussed in the recently published "Science and technology roadmap for graphene, related two-dimensional crystals, and hybrid systems". The roadmap was developed within the framework of Europe's Graphene Flagship – an international academic/industrial consortium, part-funded by the European Commission, devoted to the development of graphene and other layered materials.